I stayed in a double room and everything was perfect. I stayed here with my friend over the weekend, we had a private en-suite bathroom. The hostel is perfectly located, only a short 5 minute walk to the central station and town centre! Overall good stay! The rooms were nice (no bunk beds) and it had an amazing location. The staff were very friendly and helpful too. the rooms and bathrooms were clean but the pillows on the bed are in dire need of replacing, they were really flat and lumpy. Great location right next to the train station, inexpensive, comfortable if sparse, and very friendly staff. 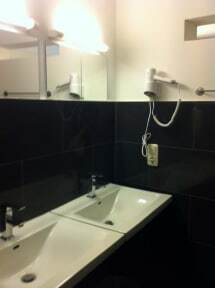 Perfect if you just need a place to shower and crash before / after a long day of sight-seeing. The hostel was friendly and welcoming. Quite busy with multiple groups and good bar. This was good for us but might not be for you if you want a quiet hostel. That said I don’t think it was noisy and the location was excellent and buffet breakfast available. Nice and decent hotel for one night stay. Main advantage is , it is very closest to the Colonge cental station. It was the cheapest we found in/around the old town area, but it was still pricey. Looks and feels like a normal hotel, bar area was nice but overall, it didn’t have the hostel feel. Fantastic location, nice staff, and clean room. Solid hostel. Big draw is how close it is to the central station. Also nice not to have bunk beds. Facilities were clean and well maintained and the staff were nice. It is situated in prime location, walking distance from cathedral and train station. Overall facility is good with friendly staff. Stayed only for a night so can't comment on social aspect.